New York has a total of 87 acres devoted to apricot production, approximately 10 of which are located in the Hudson Valley. Apricots thrive in climates with long, hot summers and cool, wet winters making them a challenging crop for NY orchardists. The bulk of the US production is in California. The largest producers of apricots in the world are China and Turkey. Apricots mature in early summer and are harvested just as the skin changes from green to yellow before the fruit is too soft and subject to bruising. The U.S. fresh market production season is relatively short, lasting from mid-May through mid-August. However, processed apricots are typically available throughout the year. 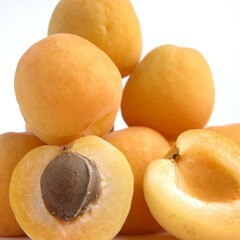 Apricot consumption is around 1 lb per person per year, with the dried market increasing over the past several decades. The information contained in this preliminary version of HB-66 has been assembled from information prepared by nearly 100 authors from around the world. The version posted here is a revised copy of a Draft made available online in November 2002 for author and public review and comment.